As in most things, one can have a reasonable debate over issues. 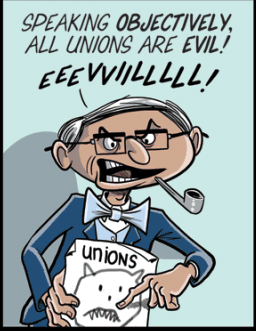 However, sometimes there is such idiocy, such as this pithy little cartoon regarding unions, that deserve… a fisking! 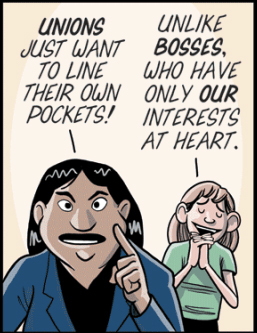 Union bosses do want to line their own pockets. Many labor union employees have their own labor union to protect them against the union bosses and the membership of said unions. Unlike unions, who only care for a portion of one’s paycheck, an employer cares about what an employee contributes in actual value to the company and the union. This is not to say that all employers are selfless individuals, but only that they care more about the employee than most union bosses. When, in most of our lifetimes, has a union had a positive contribution to a workers life, aside from some pampered drivelity? Most companies are small companies that can not afford to guarantee a lifetime of free stuff without a guarantee of a return on investment or at least the promise thereof. 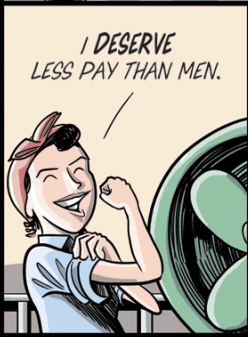 The “Pay Gap” is a myth. By many metrics, women are doing better than men. Again, when, in most of our lifetimes, has this type of horror-filled 19th century mentality been present? Even today with public employee unions, being the majority, by size, of unions, care more about employees than their own bottom line? From experience, the answer is NO. They have no problem with the suffering of those who don’t pony up their paychecks to their union masters. A silly ad hominem attack. All “Right to Work” means is that you neither have to join a union you don’t want to join or fork over money to them that you don’t want to hand over. Having lived in states with both a Right to Work and without, I’ve noticed that the only difference is in how much of the paycheck one gets to keep. “Right to work” is superior. 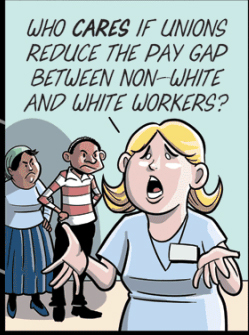 Labor Unions have been a long, long, long, standing example of institutional racism. Businesses spend money influencing politics by the will of the owners, either directly or by their voted upon Board of Directors and the officers chosen thereby. 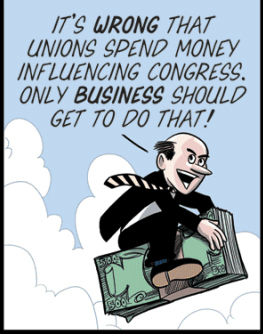 Labor Unions work similarly… except for the money they take from non-members in states that aren’t Right to Work, which is then used often against the interest of workers who aren’t Union members, not to speak of the Union members who aren’t part of the political elite. Thus, all in all, stop whining. This entry was posted in Progressives and tagged derp, FacePalm, Unions, WTF. Bookmark the permalink. 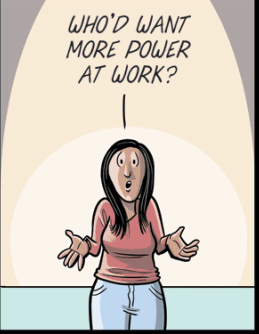 -I does wish the cartoonist would review the grammar rules for “Lower” and “Less”. 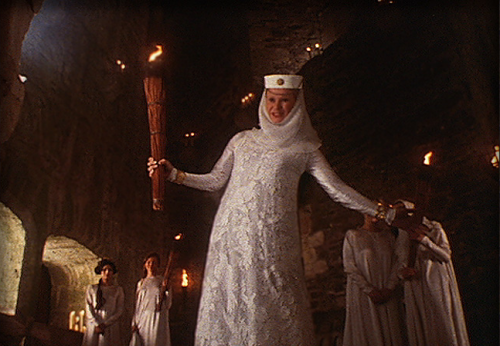 That sort of thing clangs around in my head distracting me from whatever the subject were. See what I mean? -A pay scale based on job assignment rather than Nepotism or favoritism is one foundation for the origin of Associations, Unions, etc. and that is a strong mark in favor of fairness. 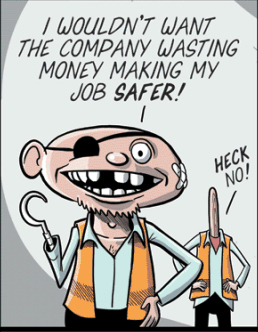 To clearly define job assignments, including safety requirements, is also a positive. -The collective bargaining only means the job definitions are provided an agreed-to pay scale, including benefits and increases. And therein lies the beginnings of danger for the concept. -The company performance might be projected accurately, providing a means for increases but it also might be operating on a thin thread with no margin for increase. Regional cultural practices now influence the discussion: Northern confrontational style of discussion and the “demands are met or else” give no room for adjustment and result in acrimony at best, violence and destruction at worst. -Adding fuel to the clash is the practice of damning any replacement employees instead of allowing the market to meet the employment needs. Tyranny. -Small business (my experience is primarily in the South) require cooperation rather than confrontation, so union negotiation tactics from the North do not generally produce positive results. -Right-to-Work DOES include right-to-terminate; just as in any relationship you are not required to continue if you don’t want to. Works in both directions. 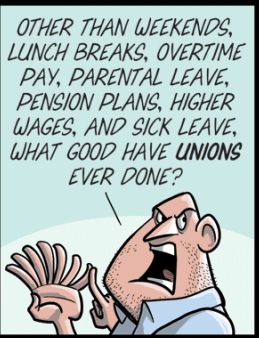 Unions have their place and are part of a responsible workplace, if managed by mature professional adults. Otherwise they are avenues for theft, bribery, coercion, and violence. But in Union shops that eliminates flexibility: when something needs to be done the Union work rules prohibit “borrowing” a worker from one classification for another classification that temporarily does not have enough workers. And so one sees workers sitting around doing nothing while tasks are delayed.